Fay, G., J.S. Link, J.A. Hare. 2017. Assessing the effects of ocean acidification in the Northeast US using an end-to-end marine ecosystem model. Ecological Modeling 347: 1-10. Siqi Li, S., Chen, C., Wu, X., Beardsley, R.C., Li, M. 2017. Impacts of ocean dynamics and parameterizations on hurricane simulation: an experiment for Hurricane Sandy with ARW. Monthly Weather Review. In press. Song, X., and L. Yu. 2017. Air-Sea heat flux climatologies in the Mediterranean Sea: Surface energy balance and its consistency with ocean heat storage. J. Geophys. Res., Special issue on dense water formations in the North Western Mediterranean: from the physical forcings to the biogeochemical consequences. Fay, G. and J. Brust. 2016. Peer review report for the Atlantic Red Drum stock assessment. Report to the Atlantic States Marine Fisheries Commission. April 2016. 14p. Fay, G. and S. Cadrin. 2016. Simulation testing assessment models for black sea bass. SAW62 Black Sea Bass Model Meeting Working Paper, BSB WP A1 Appendix A6. 26p. Stock Assessment of Black Sea Bass for 2016 draft report, NOAA Fisheries Northeast Fisheries Science Center. Fay, G., J. McNamee, S. Cadrin. 2016. Stock Synthesis Application to Black Sea Bass. SAW62 Black Sea Bass Model Meeting Working Paper, BSB WP A1 Appendix A9. 59p. Stock Assessment of Black Sea Bass for 2016 draft report, NOAA Fisheries Northeast Fisheries Science Center. Honig, P., C. Stewart, S.M. Gallager. Automated substrate classification from HabCam, a stereo benthic imaging system. In Review. J Ocean. Engineering. Olsen E, G. Fay, S. Gaichas, R. Gamble, S. Lucey, J.S. Link. 2016. Ecosystem Model Skill Assessment. Yes We Can! PLoS ONE 11(1): e0146467. Shank, T. M., E. Cordes. 2016. 6th International Symposium on Deep-Sea Corals Symposium Guide. Conference proceedings. Shank, B, D. Hart, S.M. Gallager, K. Stokesbury. Abundance and spatial distribution of Yellowtail Flounder in Closed Area II South, 2010 vs. 2012, from an image-based survey. ICES. Submitted for NOAA internal reporting. Yogesh G., W. Cho, M. Campbell, J. Pineda, E. Clarke, H. Singh. 2016. “Anomaly Detection in Unstructured Environments using Bayesian Nonparametric Scene Modeling”, Proceedings of the 2016 IEEE International Conference on Robotics and Automation, pg 2651-2656. Yu, L., R. F. Adler, G. J. Huffman, X. Jin, S. Kato, N. G. Loeb, P. W. Stackhouse, R. A. Weller, and A. C. Wilber. 2016. Global ocean heat, freshwater, and momentum fluxes. In The State of Climate in 2015. Fay, G. & J. Brust. 2016. Peer review report for the Atlantic Red Drum stock assessment. Report to the Atlantic States Marine Fisheries Commission. April 2016. 14p. Friedland, K. D., R. T. Leaf, J. Kane, D. Tommasi, R. G. Asch, N. Rebuck, R. Ji, S. I. Large, C. Stock, V. S. Saba. 2015. Spring Bloom Dynamics and Zooplankton Biomass Response on the US Northeast Continental Shelf. Continental Shelf Research 102:47-61. Josey, S. A., J. Grist, D. Kieke, I. Yashayaev, L. Yu. 2015: Extraordinary ocean cooling and new dense water formation in the North Atlantic. In “State of the Climate in 2014”. Bull. Amer. Meteor. Soc., 96(7), S67-S68. McNamee, J., G. Fay, and S. Cadrin. 2015. Data Limited Techniques for Tier 4 Stocks: An alternative approach to setting harvest control rules using closed loop simulations for management strategy evaluation. Report to the Mid-Atlantic Fishery Management Council Scientific and Statistical Committee. July 2015. 57p. Mills, K. E., R. Griffis, A. Haynie, G. Pecl, A. Pershing. 2015. 2015 Santos Workshop on “Moving towards climate-ready fishery systems: Regional comparisons of climate adaptation in marine fisheries.” PICES Press 23(2): 14-16. Townsend, D.W., N.R. Pettigrew, M.A. Thomas, M.G. Neary, D.J. McGillicuddy, Jr., J. O'Donnell. 2015. Water masses and nutrient sources to the Gulf of Maine. Journal of Marine Research 73: 93–122. Holte, J., Straneo, F., Farrar, J. T., R.A. Weller. 2014. Combining mooring and Argo data to estimate a heat budget for the southeast Pacific. J. Geophys. Res.,119, 11, pages 8162–8176. Petrik, C.M. R. Ji, C. Davis, 2014. Interannual differences in larval haddock survival: hypothesis testing with a 3D biophysical model of Georges Bank. Fisheries Oceanography, 23(6): 521-553. Tian, R., C. Chen, J. Qi, R. Ji, R. C. Beardsley ,C. S. Davis, 2014. Model Study of Nutrient and Phytoplankton Dynamics in the Gulf of Maine: Patterns and Drivers for Seasonal and Interannual Variability. ICES Journal of Marine Sciences, 72(2): 388-402. Yu, L., X. Jin, P.W. Stackhouse Jr., Y. Xue, A. Kumar. 2014. Global Oceans Ocean surface heat and momentum fluxes [in State of the Climate in 2013]. Bull. Amer. Meteor. Soc., 95 (7), S57-S60. Chen, C., Beardsley, R. C., Cowles, G., Qi, J., Lai, Z., Gao, G., Stuebe, D., Liu, H., Xu, Q., Xue, P., Ge, J., Ji, R., Hu, S., Tian, R., Huang, H., Wu, L., Lin, H., Sun, Y., Zhao, L., 2013. An unstructured-grid, finite-volume community ocean model FVCOM user manual (3rd edition). SMAST/UMASSD Technical Report-13-0701, University of Massachusetts-Dartmouth, pp 404. Jin D, Hoagland P, Wikgren B. 2013. An empirical analysis of the economic value of ocean space associated with commercial fishing. Mar Pol. 42:74-84. Plueddemann, A., J. Ryder, B. Pietro, J. Smith, C. Duncombe Rae, R. Lukas, C. Nossee, J. Snyder, L. Bariteau, S.J. Park D. Hashisaka, E. Roth, C. Fumar, A. Andrews and N. Seymour, 2013. WHOI Hawaii Ocean Timeseries Station (WHOTS): WHOTS-9 2012 mooring turnaround cruise report, WHOI Tech. Rept., WHOI-2013-04, 93 pp. Smith, P.C. N.R. Pettigrew, P. Yeats, D.W. Townsend, G. Han. 2012. Regime shift in the Gulf of Maine. pp. 185-203, In: Stephenson, R.L., J.H. Annala, J.A. Runge and M. Hall-Arber, (Eds). Advancing an Ecosystem Approach in the Gulf of Maine. American Fisheries Society, Symposium 79, Bethesda, MD. 415 pp. Moore, M.J., Knowlton, A.R., Landry, S.C., Robbins, J., McKenna, H., Werner, T. 2011. Case Studies in Entanglements of Right Whales (Eubalaena glacialis) and Humpback Whales (Megaptera novaeangliae) from the East Coast of North America. Workshop Proceedings - Compiled as a reference for the Dynamics of Large Whale Entanglements in Fishing Gear Workshop, February 9-11, 2011. Held at Woods Hole Oceanographic Institution. Schanze, J.J., R.W. Schmitt, L. Yu. 2011. The global oceanic freshwater cycle: A best-estimate quantification. Journal of Marine Research 68: 569-595. Yu, L. 2011. Sea surface exchanges of momentum, heat, and freshwater determined by satellite remote sensing. Climate and Oceans: A Derivative of the Encyclopedia of Ocean Sciences. J. Steele, S. A. Thorpe, K. K. Turekian, (Eds). 119. Academic Press, London, UK. 636 pp. Yu, L., X. Jin, R.A. Weller. 2011. Global ocean heat fluxes [in “State of the Climate in 2010”]. Bulletin of the American Meteorological Society 92(6): S1-S266, 9:6, 84-85. Holland, D.S., P. Pinto da Silva, and J. Wiersma. 2010. A survey of social capital and attitudes toward management in the New England groundfish fishery. US Department of Commerce, Northeast Fisheries Science Center Reference Document 10-12; 13 p.
Proshutinsky, A., M.-L. Timmermans, I. Ashik A. Beszczynska-Moeller, E. Carmack, I. Frolov, M. Itoh, T. Kikuchi, R. Krishfield, F. McLaughlin, S. Nishino, B. Rabe, U. Schauer, K. Shimada, V. Sokolov, M. Steele, J. Toole, W. Williams, R. Woodgate, M. Yamamoto-Kawai, S. Zimmermann. 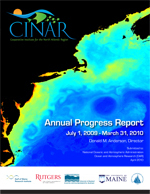 Ocean, [in "State of the Climate in 2010"]. Bull. Amer. Meteor. Soc., 92 (6), S145–S148. Yu, L. 2010. On surface salinity skin effect under evaporation conditions and implications for remote sensing of ocean salinity. Journal of Physical Oceanography 40: 85-102. Yu, L., and R.A. Weller. 2010. Global ocean heat fluxes [in “State of the Climate in 2009”]. Bulletin of the American Meteorological Society 91 (7): S59-S63. Ghate, V.P., B.A. Albrecht, C.W. Fairall, R.A. Weller. 2009. Climatology of surface meteorology, surface fluxes, cloud fraction and radiative forcing over south-east Pacific from buoy observations. Journal of Climate 22: 5527-5540. Vialard, J., J-P. Duvel, M. McPhaden, P. Bouruet-Aubertot, B. Ward, E. Key, D. Bourras, R. Weller, P. Minnett, A. Weill, C. Cassou, L. Eymard, T. Fristedt, C. Basdevant, Y. Dandoneau, O. Duteil, T. Izumo, C. de Boyer Montégut, S. Masson. 2009. Cirene: Air Sea Interactions in the Seychelles-Chagos thermocline ridge region. Bulletin of the American Meteorological Society 90: 45-61. Quantifying Connectivity among Populations and Communities: How do we get connected?